Tesla and Panasonic have agreed to put the further expansion of the Gigafactory on hold. Tesla still claims to be production constrained by battery supplies. Panasonic does not seem eager to make up the deficit. Panasonic (OTCPK:PCRFY) has been Tesla's (TSLA) partner for a number of years. They are Tesla's largest supplier and most important business partner and have a deep understanding of the positive and negative issues for Tesla's start-from-scratch manufacturing operations. Any signs that Panasonic is losing confidence in the process and, particularly, in Tesla's ability to generate adequate demand for the Model 3 at a profitable price level should be very concerning for investors. On April 11, the Nihon Keizai Shimbun - generally known as the "Nikkei", Japan's equivalent to the Wall Street Journal, reported (paywall) that Tesla and Panasonic had agreed to put any further expansions of Tesla's Nevada Gigafactory on hold. Nikkei's English language magazine translated the article and non-subscriber readers who have not yet reached their monthly article quota can read it here. Further, the Financial Times (Nikkei's UK subsidiary) picked up on the story and provided an English summary with additional commentary. The Gigafactory currently supplies the batteries for all of Tesla's Model 3 vehicles, and production of the batteries for the older S & X models is currently moving there from Japan. Tesla and Panasonic have already agreed to develop Gigafactory capacity to 35GWh and had previously announced plans for substantial further increases, as detailed in the articles. Tesla describes the Gigafactory as only 30% complete. When the report first came out from the Nikkei's Osaka bureau (the Nikkei is based in Tokyo but Panasonic is based in Osaka), various commentators cast doubt on its veracity because of the lack of specified sources. However, having spent much of the last 30 years living and working in Japan, I can attest that this is standard Japanese journalistic practice, partly as a result of the dwindling kisha system, which has habituated journalists and their sources to an informal, anonymous briefing system, and partly as a result of the reluctance of Japanese corporate officials to present views as their own as opposed to the collective views of the corporation. Furthermore, statements issued later in the day by Tesla and by Panasonic confirmed the substance, if not, the detail of the report. Both Tesla and Panasonic continue to invest substantial funds into Gigafactory. That said, we believe there is far more output to be gained from improving existing production equipment than was previously estimated. We are seeing significant gains from upgrading existing lines to increase output, which allows Tesla and Panasonic to achieve the same output with less spent on new equipment purchases. However, we will of course continue to make new investments in Gigafactory 1, as needed. Most importantly, contrary to what is implied in this report, our demand for cells continues to outpace supply. It remains the fundamental constraint on Tesla vehicle and Powerwall/Powerpack production." Despite some misleading headlines, this is not incompatible with the Nikkei article. Substantial funds are, no doubt, still being spent on achieving the 35GWh level and on moving S & X battery manufacturing. Tesla's comments about investments "as needed" when reading together with the statement that current battery production is insufficient clearly imply that everything is fine and that, save for a little fine-tuning to increase the efficiency of existing equipment, everything will continue as planned. Panasonic's opinion seems quite different. The statement which they released after the Nikkei report said: "Watching the demand situation, Panasonic will study additional investments over 35GWh in collaboration with Tesla,". (my emphasis). Why did Panasonic raise the demand issue? Surely, Panasonic agrees with the bulls' theory that Tesla's world class manufacturing capability and low cost components will make the Model 3 profitable even at current price/demand levels? If they don't, that would explain why they are unwilling to make substantial additional investments even though current production is being fully utilized - they would rather wait and see if there is sufficient demand for the high-priced variants to cover the (in Panasonic's opinion) higher manufacturing costs. But how can Panasonic be so far apart from Tesla on such an important issue? No doubt there will be many bulls in the comments section telling me that such a conclusion is far too big a step to take based on four words from an email. And they will be right - we need more evidence. Where to get it? My regular readers will know that my preferred source of information about Tesla is always Tesla itself. I will apply the same strategy here. Looking for more evidence on Panasonic's views, we will look at company's investor presentations - specifically, the Q3 presentation issued in February (Panasonic has a March fiscal year). Let's try to find out whether there are significant problems at the Gigafactory. Certainly, there are issues. Look at page 16. This shows Panasonic's revised expectations of sales for the year ended in March 2019 (revision of an Oct 2018 forecast to Feb 2019). 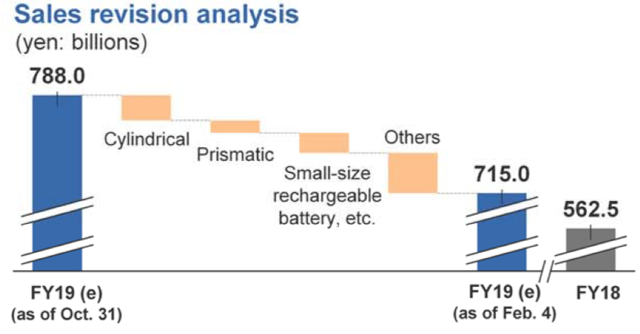 The Tesla segment is easy to isolate as Tesla uses cylindrical batteries, as opposed to the prismatic of Toyota, Panasonic's other major battery customer. 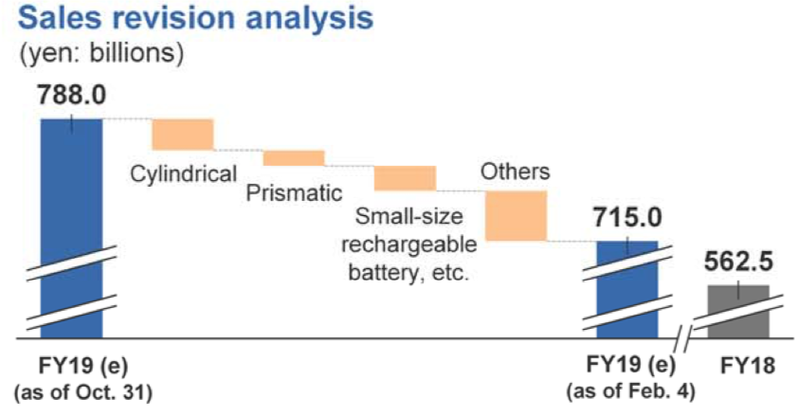 Panasonic explains, on the same page and on others, that a number of negative Gigafactory issues have impacted sales - "ramp-up costs", "delay in improving operation losses", and "temporary expenses for quality related issues". They state that stabilizing the Gigafactory is a "challenge" and they state that their objective for the current fiscal year (to March 2020) is merely to fully utilize the 35GWh factory - no mention of expansion. Our plans call for sustaining and further ramping from our significant increases in vehicle production and deliveries, particularly for Model 3... If we are unable to realize our plans, our brand, business, prospects, financial condition and operating results could be materially damaged." Panasonic is well aware that these statements are not just boilerplate. Tesla is a growth stock. It probably cannot survive if it does not keep growing demand and production. It certainly cannot justify its insanely high valuation if the growth stops. If Tesla ceases to be a growth stock, it should be priced more like a regular automaker. Since Tesla has no earnings, we cannot compare P/Es. However, if we look at price to sales, we see GM (NYSE:GM) at 0.38, Ford (NYSE:F) at 0.23, and Tesla at 2.16. That would suggest an 80-90% fall in Tesla's share price. Obviously, price to sales is not the only metric to look at here but also that comparison is a guide to the quantum of decline we might be looking at. Elon Musk and the true believers feel that Tesla can achieve growth, reduction in cost and profitability, all at the same time. Panasonic, which has more visibility into Tesla than any of us, doesn't seem so sure. Disclosure: I/we have no positions in any stocks mentioned, but may initiate a short position in TSLA over the next 72 hours. I wrote this article myself, and it expresses my own opinions. I am not receiving compensation for it (other than from Seeking Alpha). I have no business relationship with any company whose stock is mentioned in this article.